The Zombie Apocalypse or Just a Family Dealing with Jet-lag? A girlfriend of mine has just landed in China. It’s about to become her new home. Over the past week, through the miracle that is Facebook, I’ve kept up with her packing the house, saying final goodbyes and then boarding the plane with her three children. Tonight’s update is that they’ve arrived and are out to dinner. They’ve been awake for what feels like days and are trying to push through until they reach something that resembles bedtime. One by one, they are falling face first in to their dinner plates. I winced as I read about the jet-lag. It came with a series of flashbacks, all providing a familiar feeling of being slightly seasick with dry skin and burning hot eyeballs. Jet-lag and I have a very tempestuous relationship. We know each other well but we don’t get on. Yes, it’s true, we’ve spent a lot of time together over the past twelve years, but we’ve never really understood one other. In fact, after having children and enduring the combination of both their jetlag and mine, I think it’s fair to say it’s been a highly dysfunctional relationship. I don’t know about you, but I really think it’s time someone came up with a cure. Or at least better advice than keep hydrated and lay off the booze. I mean, really, anyone traveling with children knows that booze is just as important as packing your passport.Jetlag is like an unwanted gift. The obnoxious, loud, party gift that was handed to your child as you left the indoor play centre after four hours of party games, injuries and cold chicken nuggets. It’s the icing on the cake after a LONG journey.At a particular stage of the trip you may begin to ask yourself if it was worth it. Maybe the question will come as you’re walking with a permanently hunched over stoop, being led by your toddler up and down the airplane aisles. As you walk past the smiling bald man for the 81st time, he is no longer smiling, and is avoiding making eye contact, its becoming a little awkward for both of you. You’ve made multiple trips to the claustrophobic bathroom to wipe bottoms, none of which are your own. Have you tried wiping your bottom with a baby and a toddler on your lap?At some stage, it will occur to you, that once all of this is over, you will more than likely receive the gift of Jet-lag. Each little traveler, at the end of a long haul flight (or series of flights), has provided us with the joy of waking up at 2 a.m. ready to begin their day. Sometimes, on special occasions, all four travellers have given it a whirl at the same time. Yes, that was us you saw walking down Richmond Road towards the petrol station at 3 a.m., we’re not a family of crack addicts or stoners, just newly arrived Australians. Although we do display similar types of behaviour by kissing boxes of Tim Tams and Chicken Crimpies like long lost friends. Anyone traveling with children knows that when you finally do crawl in to bed after a flight, it’s highly possible it wont be for long. You see, while you were disembarking, going through customs, loading the bags and grabbing the car, that heavy weight on your shoulder, the one that has made one of your arms longer than the other, that was your child sleeping, or shall I say re-energizing. When your bright eyed, wide awake child jumps on the bed at 1a.m. and asks for a bowl of cornflakes, you’ll realize their timing is in a bit of a mess. Later, at breakfast, when they demand spaghetti and a bedtime story, it will hit you that this is about to be the longest day of your entire life, because you know the rules, you have to stay awake. If you don’t, this is about to become jet-lag groundhog day. Don’t worry about your body clock being upside down though, your face will be sure to match. Your skin will have little tracks of both the bloodshot and wrinkled variety. Your hair will remain matted and perhaps a little itchy from the friends it has made that were living in the airline cushion. Bloated? Don’t worry, it should disappear in week when you get over the constipation. Whatever you do though, don’t try and work out what that stuff is under your fingernails. If I had any tips, it would be these. It’s time to shower, using every type of shampoo and soap you have available. It’s amazing how much better the world is when you smell good. Pretend you’ve had ten hours sleep, turn the music up, call a friend, just stay away from heavy machinery, like the car, or the blender…trust me. Your biggest achievement for the day may just be that you remembered to keep putting one foot in front the other.Oh, and sugar, lots of sugar, perhaps you should open those Tim Tams? 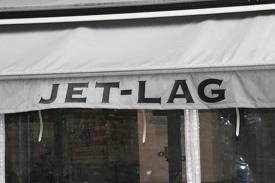 Do you have a jet-lag story? Or perhaps a tip?